Nowadays IoT infrastructure providers for smart city, smart industry, and connected vehicles are facing huge complexity and cost to manage their geo-distributed infrastructures for supporting various IoT services, especially those that require low latency. FogFlow is a distributed execution framework to dynamically orchestrate IoT services over cloud and edges, in order to reduce internal bandwidth consumption and offer low latency. By providing automated and optimized IoT service orchestration with high scalability and reliability, FogFlow helps infrastructure providers to largely reduce their operation cost. FogFlow also provides a data-centric programming model and a development tool chain for service developers and system integrators to quickly realize IoT services with low development cost and fast time-to-market. With FogFlow, service providers can easily programme their IoT services with minimal development effort and also they are able to release new IoT services with fast time-to-market. On the other hand, for IoT platform operators, FogFlow can help them to seamlessly server latency-sensitive IoT services over cloud and edges with low operation cost and optimized QoS. The resources in a cloud-edge environment are geo-distributed in nature and they are dynamically changing over time; As compared to cloud computing, resources in such a cloud-edge environment are more heterogenous and dynamical. Usage context: high level intents defined by all different types of users (developers, service consumers, data providers) to specify what they want to achieve. For example, for service consumers, they can specify which type of results are expected under which type of QoS within which geo-scope; for data providers, they can specify how their data should be utilized by whom. In FogFlow, orchestration decisions are made to meet those user-definable objectives during the runtime. We are working on more advanced algorithms to enable those new features. 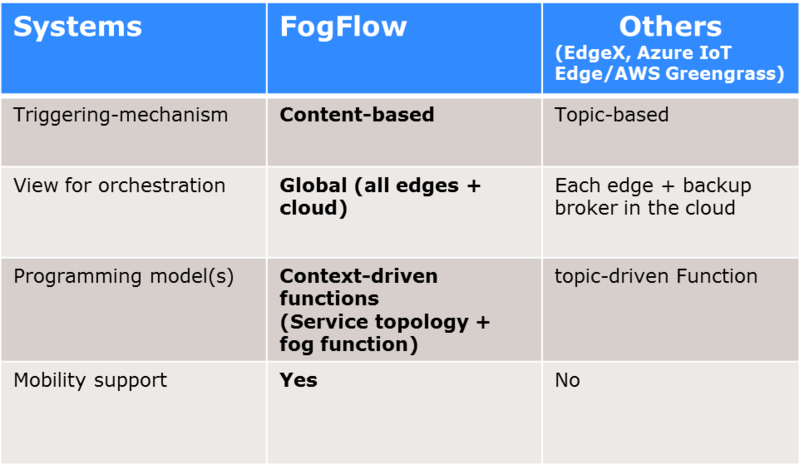 By leveraging these three kinds of context, FogFlow is able to orchestrate IoT services in a more intelligent and automatic manner. 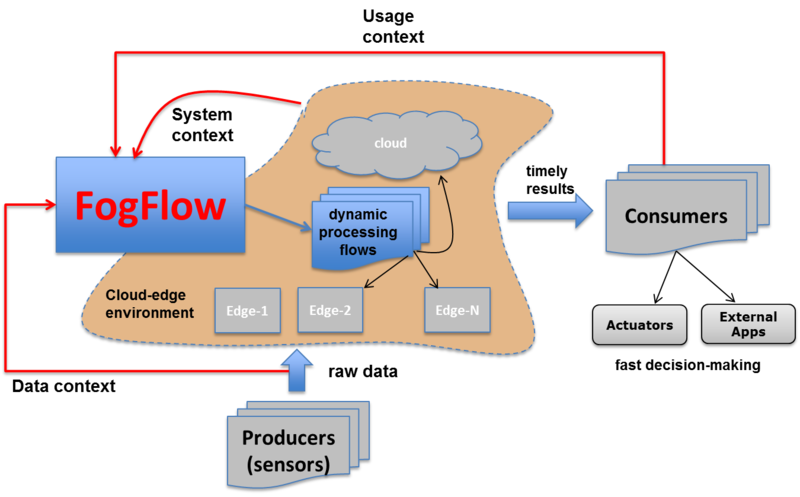 As illustrated in the following figure, FogFlow provides a standard-based and data-centric edge programming model for IoT service providers to easily and fast realize their services for various business demands. With its data-driven and optimized service orchestration mechanism, FogFlow helps infrastructure providers to automatically and efficiently manage thousands of cloud and edge nodes for city-scale IoT services to achieve optimized performance. In large scale IoT projects like Smart Cities or Smart Factories, FogFlow can therefore save development and operation cost, improve productivity, provide fast time-to-market, as well as increase scalability and reliability. As compared to the other existing IoT edge computing frameworks, such as EdgeX, Azure IoT Edge, Amazon Greengrass. FogFlow has the following unique features illustrated in the following picture. The service orchestration in FogFlow is driven by context, rather than raw events or topics. This feature is enabled by the design of introducing a new layer, namely IoT Discovery, which provides a update summary of available entity data on all brokers. As compared to event or topic based orchestration, our context-based orchestration in FogFlow is more flexible and more light-weight. This is because the orchestration decisions in FogFlow can be made based on aggregated context, without reading throught all involved data streams. On the other hand, FogFlow takes into account the high level intentions defined by users to make optimized orchestration decisions for better QoS. The FogFlow services and applications are designed against a global view of all cloud nodes and edge nodes, rather than from the perspective of each individual edge node. This design principle can largely simplify the required development effort and management overhead, especially FogFlow can support well distributed applications which could run across all cloud nodes and edge nodes seamlessly without knowing the details of how tasks coordination between cloud and edge or between different edge nodes should be carried out. However, for most of the other IoT Edge Computing frameworks, services or applications are designed for each edge and they are not really distributed services or applications, because those services or applications are able to run either in the cloud or at some edge but they are not able to run over cloud nodes and edge nodes in a distributed fasion. More detailed differentiations are summarized in the following table.